1. 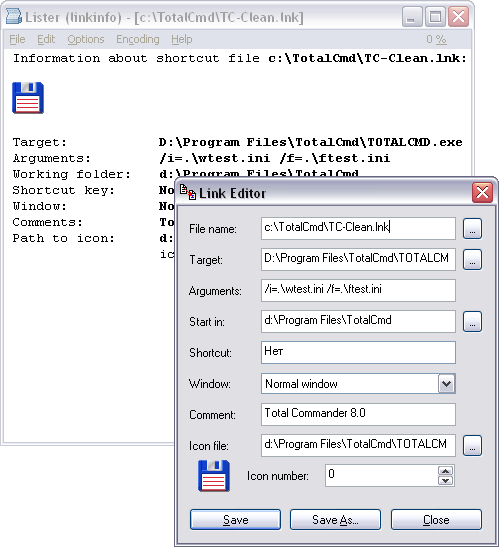 LinkEditor - Program for modifying LNK-files. Version 1.52: 1. Plugin was rewritten so that now it fully supports Unicode. 2. x64 version was added. 3. Visual representation in the Lister window was improved. 4. Added support for word-wrapping by the Lister window right border. 5. Added autoinstallation file. 6. Some other minor improvements. Version 1.51: 1. One very annoying bug was fixed: on some computers closing Lister window resulted in closing Total Commander itself. Version 1.5: 1. The icon in Lister window is now showed always, for absolutely all link files. 2. In Link Editor dialog when starting Choose Icon dialog, the defualt icon is the same icon that is showed (not always, but in most cases). Due to Win9x restrictions, in these systems this possibility works more seldom. 3. Fixed bug with saving links on system objects. 4. Now links on system objects has correct Target field.